Monkeys dominate the wildlife of Bali, and there are plenty of Monkey Forests around the island available as tourist destinations. 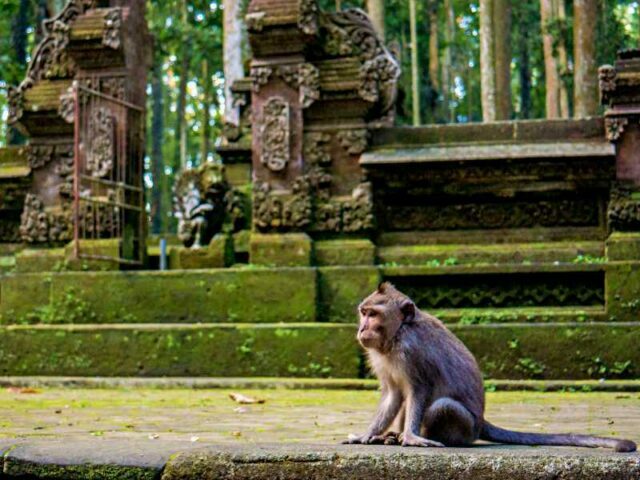 But compared to the popular Ubud Sacred Monkey Forest. Sangeh Monkey Forest sadly is the one less recognized. Fortunately, Sangeh can be a good alternative for travelers looking for monkey forest to visit with fewer crowds. It is also located not far from Denpasar, on Brahmana Road, Sangeh Village, Badung Regency. Sangeh is unique because of the nutmeg trees covering most of the area. Historians argue that once upon a time, an ancient community planted those trees deliberately. It is impossible for the trees to grow concentrated by themselves in one specific place. The legend, however, tells a story about walking trees that travel from Bali's Agung Mountain toward the ancient Mengwi Kingdom. It is said that there’s no other place in Bali with similar nutmeg trees. Sangeh tourism offers a comprehensive experience for visitors with various interest ranging from both nature and culture. It is also a destination for all ages. Families with small children are recommended to go here. As interaction with the monkeys can provide a delightful experience for the little ones. Nature lovers can explore the vegetation living in this forest. History enthusiast will also find Sangeh intriguing, the trees, the monkeys, and the temple each has its own legends intertwined with the others. Villagers nearby consider Sangeh's monkeys sacred and believe that they bring blessings. Their existence is inseparable from the belief that the monkeys are the incarnation of an ancient Princess' soldiers. The species inhabiting this place is Macaca fascicularis. A type of monkey with a long grey tail. Monkey's population in this forest is around 700 monkeys. Visitors may interact with the monkeys in several ways. The monkeys here are tame and friendly enough to play with. Visitors can take pictures with them and also feed them. There are shops nearby selling some foods such as bananas, peanuts or sweet potatoes that visitor can feed the monkeys with. Some important things to note, visitors may avoid wearing small jewelry that might attract the monkeys to steal them. Avoid wearing sunglasses, and be careful when using phones and cameras. It is also important not to harras or to annoy the monkeys. If a monkey happens to steal a visitor’s belonging, lure them with food to retrieve the belonging back, or ask officials for help. The Sangeh area covers 14 hectares of a homogeneous protected forest consists of mainly of nutmeg trees (Dipterocarpus trinervis). These trees have height as tall as 50 meters and are hundreds of years old of age. Locals believe that these nutmeg trees cannot grow in other places in Bali except in Sangeh. The myth tells a story about the trees traveling to another place but had to stop in this place because locals saw them. The word Sangeh is named from this legend. The word "Sa" which means people and "Ngeh" which means "seeing". Apart from the nutmeg trees, there are 54 other variety of plants here for botany enthusiast to enjoy. Among them are Sandpaper (Tetracera scadens), Buni tree (Antidesma bunius), Cempaka tree (Michelia camphaka), and many others. Sangeh monkey Forest also hosts a unique tree with trunks resembling as both men and women genitalia. Local calls this tree “Lanang Wadon” (Lanang means man while Wadon means woman). This tree is also one of the unique sights of Sangeh. Sangeh Monkey Forest is also known for its temples and statues. These ancient structures are almost as old as the forest itself. There are two Hindu Temples (Pura), the biggest one is called Pura Bukit Sari (Bukit Sari Temple) and a smaller one called Pura Melanting. 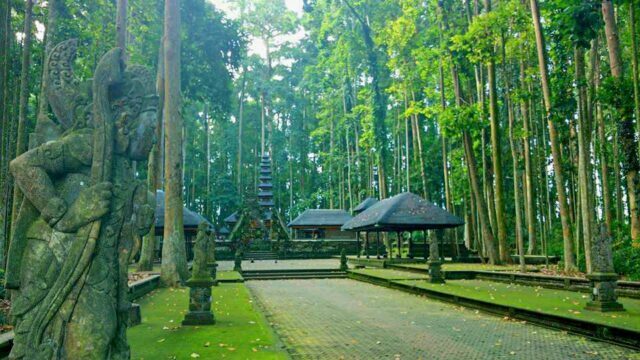 Bukit Sari temple is built during the era of the ancient Kingdom Mengwi on 17th century and situated in the center of the Sangeh Forest. Up until now, both are still well maintained and serve as a place of worship for the surrounding Hindu community. As visitors enter the place, a giant statue of Rahwana, being attacked by dozens of monkeys, provides a welcome sight. Rahwana's giant sculpture design is taken from the Ramayana story, a popular Hindu's mythology. 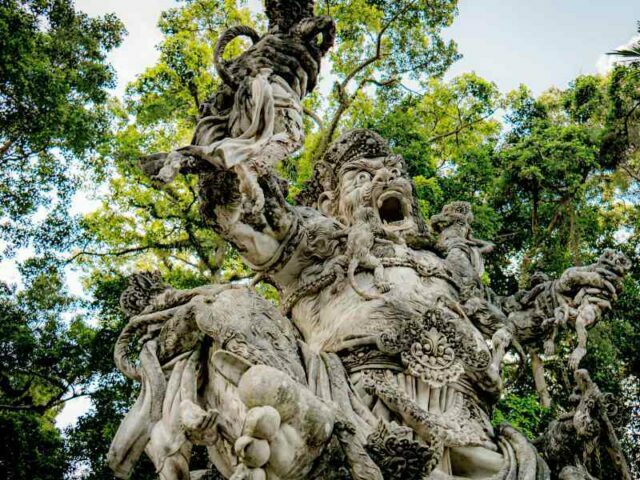 Another type of statue is the Garuda statue, a mythical bird serving as a ride for one of the Hindu Gods, Wisnu. Green moss covers most part of these statues, making them look even more mystical. The official opening hour is from 8 AM to 6 PM. Ticket price is affordable and considered cheap compared to other monkey forests in Bali. The place is open seven days a week, but the temple may close for visitors during religious ceremonies. See: The Oldest Hindu Temple and Gate of Heaven, Lempuyang Temple. 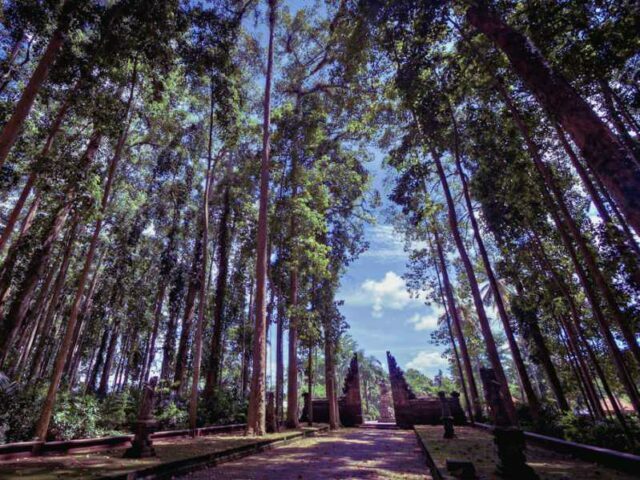 Unlike its similar destination Monkey Forest in Ubud, Sangeh entrance fee is definitely cheaper. There's also a small parking fee for tourists coming with their own vehicles. See: GWK Cultural Park, Dance Performance & Theather Schedule. Sangeh provides basic facilities like bathrooms and spacious parking space. There is a guide service available in assisting visitors to show around and explore the forest. There are also souvenir shops selling merchandise. A small stall selling food for visitors and some snack for feeding the monkeys. Sangeh monkey forest also provides Balinese costume. Dress in one of those Balinese costumes and strike a perfect pose. An additional fee applies for the costume and photo shoot. Information center also available near the gate should tourists need an assistance. Sangeh is relatively not far from central Denpasar. It is only 25 km from Denpasar with travel duration around 30 minutes. Sangeh Monkey Forest also close to Pura Taman Ayun, a scenic temple known for the scenery surrounding. By public transportation, tourist can go by bus. Hop on the bus with the route to Petang from Wayangan Terminal Denpasar, and hop off right in front of the location. Other choices include taxis and motorcycle ojek. However, it is more recommended to rent private vehicles instead. Rental vehicles provide more flexibility for tourists to explore the site. And it might also a cheaper option for those traveling in a group. The forest located rigth in Jl. Brahmana, Sangeh, Abiansemal, Kabupaten Badung, Bali 80353.